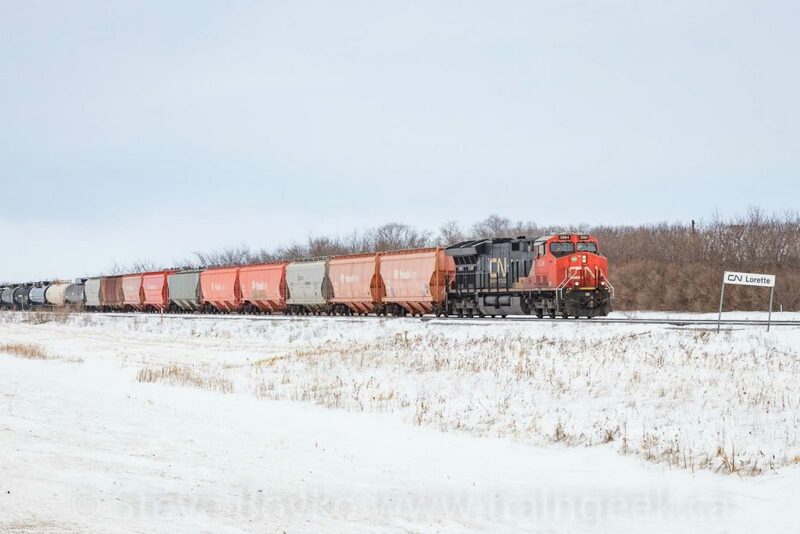 It was February 3, 2019 and I was out railfanning on the last few miles of the CN Sprague subdivision, around the Lorette siding at mile 138.2. In the hour or so that I was out there, I saw three trains and a meet. I encountered CN 3054 West as I was driving out from Winnipeg along the Trans-Canada Highway. It had a wide variety of cars on it, with CN 3049 as the mid-train locomotive (DPU / Distributed Power Unit). Railways put locomotives in the middle or end of a train for a few reasons; in this case it was probably to help keep air pressure up in the brake lines in the bitter cold. It was definitely cold on that day. I continued east along the highway, intending to visit the automated rail inspection portal near Ste. Anne. I waited in my car, because it was pretty cold: air temperature of -22C with a brisk wind giving a wind chill of -35C… too cold to stand outside. After fifteen minutes or so, the signals lit up, indicating an approaching train. 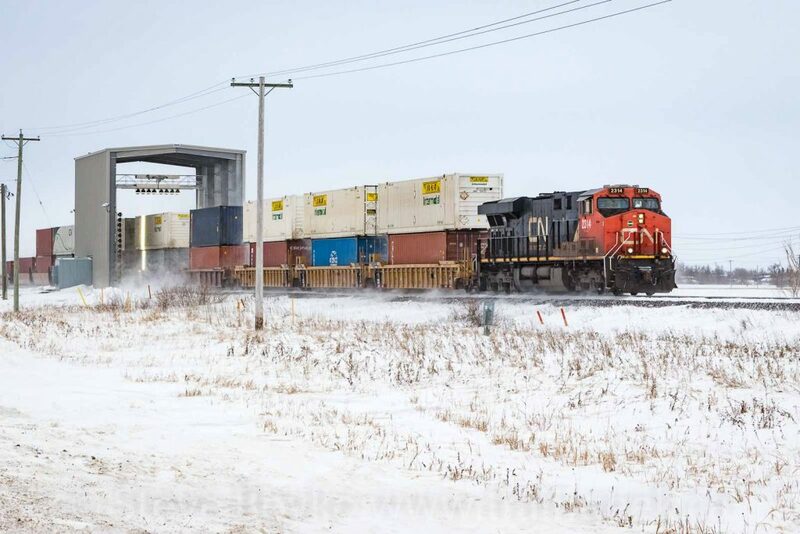 Within a couple of minutes, CN 2314 West came storming through the portal with a container train in tow. I wrote about CN’s Rail Inspection Portals already. Note the light on the side of the car – I understand it is pretty bright at night! I hope to see that someday. Mid train locomotive CN 2329 passed by. As soon as the tail end cleared, I ran back to my car, as I was half frozen! 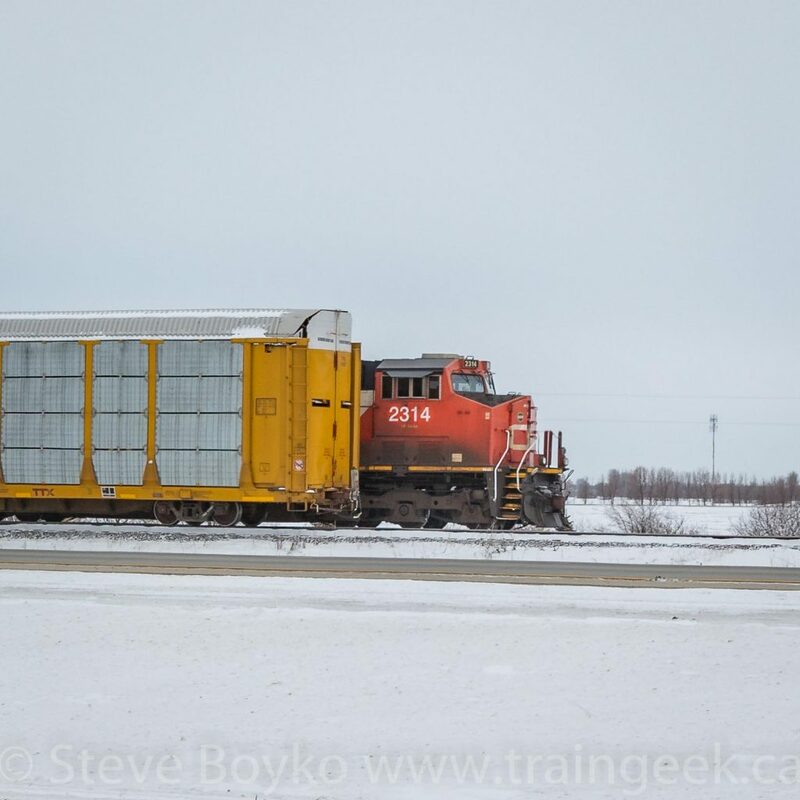 I drove back toward Winnipeg and the Lorette siding, catching up to the container train. 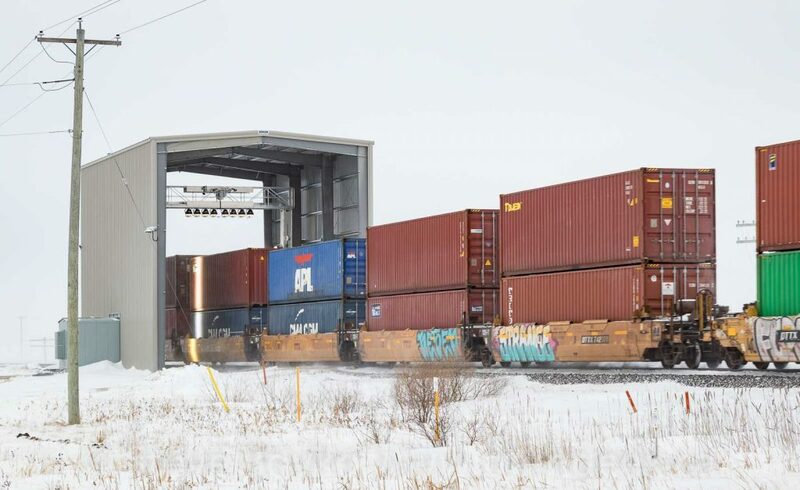 When I got to the siding, the crew of CN 2287 East were on the ground inspecting the intermodal train. I drove a bit farther west and found the mid-train locomotives on the east-facing train. In the photo below, you can see the mid-train locomotive of the container train sliding behind the two mid-train locomotives of the general freight train. I drove a little further west to the end of the waiting train, and caught CN 2314 sliding out from behind the standing train. That was the end of my railfanning for that day – a pretty productive hour. Two more trains on another day – February 12. 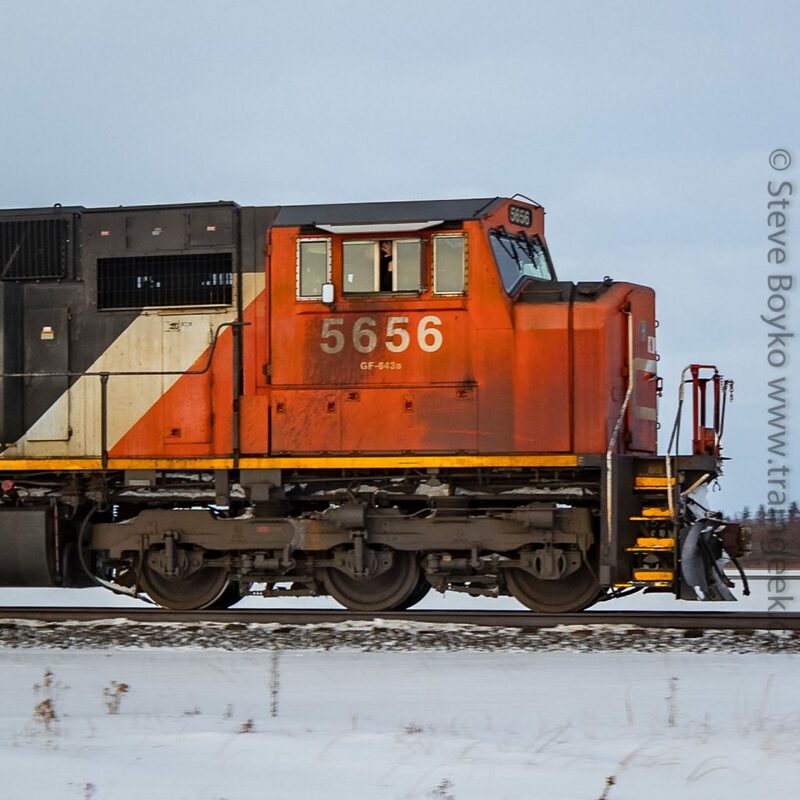 I caught CN 5656 East leaving Winnipeg, between Lorette and Navin on the last few miles of the Sprague subdivision. I remember driving along a grid road to get this shot, and I remember that the driving was a little treacherous because it had recently snowed and the road wasn’t plowed. My Civic’s winter tires did the job and kept me on the road. The engineer gave me a nice wave! I headed back into Winnipeg. I found a container train at the south / east end of Symington Yard, waiting for its turn to go out on the Sprague subdivision. Note the fresh snow tracks at bottom left. There were some coil cars waiting to go over the hump in Symington Yard. I’m not sure what the “JFBM” written on the car covers means.